Italian sculptor. He is best known as the friend and occasional collaborator of Jacopo della Quercia in Lucca and Siena, but he already had a considerable reputation before his association with della Quercia. In 1401 Francesco was invited to participate in the competition for the second set of bronze doors for the Florentine Baptistery together with Lorenzo Ghiberti, Filippo Brunelleschi, Niccol di Pietro Lamberti, Niccol d Arezzo, Simone da Colle and Jacopo della Quercia. 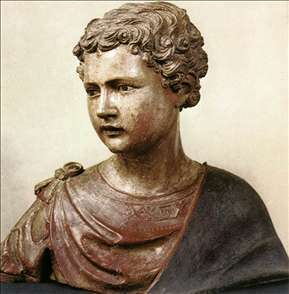 His first dated work is a polychromed wooden statue of the standing Virgin and Child (1403), in S Andrea, Palaia. Both the delicate Virgin and Child and the rigidly iconic St Peter (Montalcino, Museo Diocesano) are in the Late Gothic style then current in Pisa, and show the influence of Nino Pisano in particular. Various works have been attributed to him on the basis if three documented polychromed busts depicting the patrons of Siena, San Crescenzio, San Savino and San Vittore, which were commissioned from him in 1408. See more details about "San Crescenzio"